TECHNICOLD® remote air conditioning consists of two major components: First, the condensing unit and second the evaporator unit. Condensing units are constructed in the smallest attainable size to take advantage of any and all feasible installation locations. Placement of the condensing unit may be in the engine room, under the floor or tucked into any convenient or unused location. Reverse cycle is available when heating is desired. TECHNICOLD® condensing units consist of the compressor, and a fluted cupronickel counterflow condenser. The condenser uses sea water to remove heat from the refrigerant. 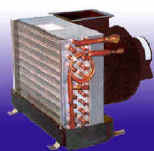 Soft copper refrigerant tubing connects the condensing unit to the evaporator which is located in the living space to be cooled or heated. A non-corrosive and non-conductive bakelite electrical box holds the start capacitor, start relay, and the run capacitor. This combination allows the compressor easier starting abilities on low voltage situations. All units are available in most voltages and 50/60 cycle operation. TECHNICOLD® incorporates a quiet, efficient and reliable sealed hermetic compressor mounted on a 16 gauge 316L stainless steel platform with vibration isolators. A fluted coaxial "tube-in-tube" self-cleaning cupronickel counter-flow condenser is designed for optimum heat transfer with minimum water flow. TECHNICOLD® condensing units incorporate safety controls that few other manufacturers offer these features as standard equipment. A low pressure control protects the compressor from damage by cycling the compressor off if the air flow is restricted through the evaporator or if the system is low on refrigerant. A manual reset high pressure control is used to shut the compressor off and prevent short cycling when cooling water is insufficient. TECHNICOLD® condensing units are constructed as compactly as possible on a heavy gauge 316L stainless steel base. The 316L stainless steel base and hardware will ensure years of corrosion free service while maintaining the units original new appearance. Reverse cycle heating capacity is dependent on seawater temperature. Capacity diminishes as water temperature decreases. Operation on 50 HZ decreases capacity 17%. TECHNICOLD® evaporators are designed to be used with remote condensing units. Single or multiple evaporators may be used with a single condensing unit which has a matching BTU capacity. The location of the evaporator unit can be in a closet, under a settee, berth, or in a locker. Flex duct or plenum box connected to the blower will discharge air into the area to be cooled. TECHNICOLD® offers a wide selection of standard evaporators. Our high volume variable speed squirrel cage blowers can be rotated 120 degrees making the units top or side discharge. The blower is foam insulated, thus providing low noise level with highly efficient air distribution. TECHNICOLD® evaporators are constructed of 16 gauge 316L stainless steel with heliarc welded seams throughout. A two inch condensate pan with two drains assures proper drainage and prevents overflows in rough seas. Drip pans and blowers are fully insulated to prevent unnecessary sweating. All TECHNICOLD® evaporators are available with down discharge or remote blowers for ceiling mounted installations. Our 24,000 BTU and 32,000 BTU evaporators incorporate a unique twin blower style. This important feature not only provides the lowest noise levels but also maintains a low height profile. TECHNICOLD® evaporators can also be custom-built to most any specification. All units are available in most voltages. All evaporators are available with down discharge or remote blower. Larger or custom designed evaporators are available upon request.